After a two-year study, the American Astronomical Society (AAS) has recommended more than a dozen steps that colleges and universities can take to increase the number of students from underrepresented groups who earn graduate degrees in the astronomical sciences. At present only about 6% of astronomy PhDs go to students from racial or ethnic minorities, whereas these groups account for some 30% of the US population. The AAS wants the professional astronomical community to reflect the diversity of society not only racially and ethnically, but also in terms of gender identity, sexual orientation, neurodiversity, and disability status. Getting there will require proactive efforts by degree-granting institutions to recruit and retain a more diverse pool of graduate students by, for example, ensuring that their admissions criteria are free of bias and that students receive adequate mentoring throughout their studies. The AAS Task Force on Diversity and Inclusion in Astronomy Graduate Education, established in January 2017, presented its report at a plenary session during the Society’s 233rd meeting in Seattle, Washington, in January 2019. At the same meeting the AAS Board of Trustees, the Society’s governing body, voted to endorse the group’s recommendations. “The drive to make our field inclusive is fundamental to the AAS mission ‘to enhance and share humanity’s scientific understanding of the universe,’” says AAS President Megan Donahue (Michigan State University). “Evidence shows that more diverse leadership teams make better choices. In the context of science, diverse teams ask a wider range of questions and are more creative in coming up with answers, enabling them to define and solve scientific problems in new ways. A more inclusive scientific community will not only do better science, but will also share our discoveries with a broader public, so that together we can start making better choices, for all of us." Suggestions for colleges and universities that grant astronomy-related degrees fall into three categories: admissions, retention, and metrics for success and the gathering of relevant data. The task force included three nationally prominent social scientists brought in to make sure that the report's recommended practices in each category have been proven effective by research. The report serves as a "how to" guide for departments, including practical steps they can take to implement each recommendation as well as the research results backing them up. In admissions, one recommendation is that graduate programs partner with and recruit from undergraduate programs that produce large numbers of graduates from underrepresented groups, such as historically Black colleges and universities, Hispanic-serving institutions, and tribal colleges. One way to improve student retention of underrepresented students is to provide a family-friendly and accessible environment, including but not limited to full compliance with the Americans with Disabilities Act. The AAS gets some suggestions too. For example, the report urges the Society to partner with the American Institute of Physics (AIP) Statistical Research Center to collect and report demographic and climate data; the AAS is one of 10 AIP member societies and has collaborated with the Statistical Research Center before. The task force also asks the AAS to actively encourage PhD-granting departments to formally adopt the report’s recommendations. Alex Rudolph (Cal Poly Pomona), the other co-chair of the task force, says, “Our fundamental philosophy is that change requires three things: investment in processes that promote change, measurement of ongoing progress, and recognition of departments that are making progress.” On that front the AAS will, as the task force recommends, create an online platform to support departments in adopting best practices and to track their adoption over time. 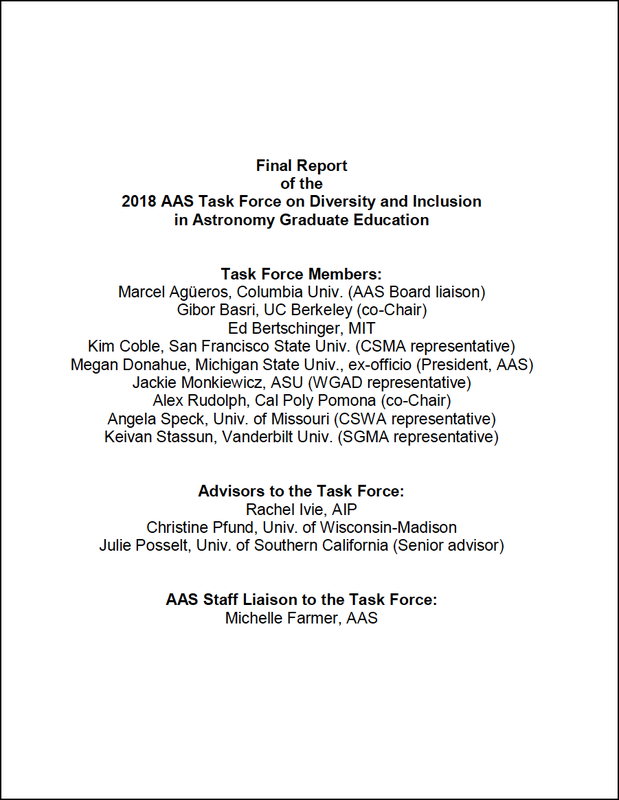 The full report of the AAS Task Force on Diversity and Inclusion in Astronomy Graduate Education is available in the Bulletin of the American Astronomical Society (BAAS).